The moment you enter Peru, you know you are in heaven. This is probably the most archaeologically rich country in the world. From Machu Picchu to the heavenly mountains of the Andes. The riding is spectacular and the food and culture equally diverse. I would spend a few weeks here, visiting Cusco, Jaen, Trujillo, and taking a days motorbike trip through the Sacred Valley. The country has a surprise around every corner. I had to stop off a few times on the side of the road to do some maintenance, and my front tire began leaking air at an accelerated rate, something I would have to endure for my entire journey. My base for Machu Picchu and the Sacred Valley would be Cusco, a city on a mountain with fantastic views and a great old town. I also witnessed first hand how the police treat the indigenous peoples of this great country, and it was demoralizing to see. Considering the value these peoples bring to tourism in this country it is something that really stopped me in my tracks, not only what they did, but the seeming enjoyment that got out of the raid. In each of my blog posts, I write about what I have done for the day, I have map views of my rides from the Rever App and I discuss the cities I have passed through on my way. I hope you enjoy the posts and can learn something from them. Some blog posts include information about border crossings, what to have with you, how to plan them and what to expect at each frontier. After spending a full day and night touring Machu Picchu, Peru I was fortunate to tour the Sacred Valley with Peru Moto Tours! I started the tour at 8 am and was back in Cusco by 5 pm. Christopher and I went high up into the Andes and swept along single tracks in and out of villages through the Sacred Valley. After spending a day touring Cusco, Peru and organizing my trip to Machu Pichu (which took some time), it was Machu Picchu Day! I left my home at 7 am and rode to Poroy Station where I would embark on my journey to Machu Picchu with Belmond Hiram Bingham train and tour. The ride was mostly through small towns and was a lot of fun, even though I had some weather on the journey. After spending a rough night in Abancay, Peru I had a nice slow ride into Cusco, Peru which is where I would base myself for a few days for my trips to Machu Pichu and the Sacred Valley. It would take me over 4 hours to get to Cusco, Peru taking in around 128 miles (192 kilometers) mostly on the paved roads and hugging the Andes. After spending one night in Nazca, Peru I had another long day riding to Abancay, Peru which is where I would spend only one night and make my way onto Cusco to use as my base for going to Machu Pichu, Peru. It would take me over 9 hours to get to Abancay, Peru taking in around 290 miles (462 kilometers) diving deep into the Andes again and then across the high plains. After spending five nights in Lima, Peru I had another long day riding to Nazca, Peru which is where I would spend only one night and make my way onto Abancay before my next major destination in Cusco, Peru. It would take me over 7 hours to get to Nazca, Peru taking in around 278 miles (442 kilometers) mostly on the paved roads and hugging the west side of the Andes. After spending only two nights in Trujillo, Peru I had another long day riding to Lima, Peru which is where I would spend only one night. It would take me 10 hours to get to Lima, Peru taking in around 375 miles (586 kilometers) mostly on the paved roads and hugging the South Pacific Ocean. After spending only two nights in Jaén, Peru I had a long day riding to Trujillo, Peru which is where I would spend only one night. It would take me a massive 13 hours to get to Trujillo, Peru taking in around 400 miles (625 kilometers) mostly on the paved roads. 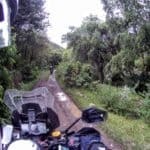 The biggest feature of this ride was going from the dense lush rainforests into the barren mountains and windswept deserts of Peru. After spending the New Years in Vilcabamba, Ecuador, I readied myself with the border crossing at La Balza on my way to Jaén, Peru. The trip would take me more than 10 hours and 200 miles (313 kilometers) across mostly on off-road dirt tracks through the Andes mountain ranges. A friend of mine, Chris, had taken this journey less than a week earlier. Within each of my albums, I have photography from each day’s ride and experiences. I try to pick only the best photos from that day so that you too can see what I see from my helmet and my lense. In all of my videos, I discuss my days riding and the things I see whilst on the road. I try to inform you every step of the way of how my day is going and what I have learned from the experience. Each video has commentary, except for any Samsung gear 360 Videos and Videos from the Drone.